Last week I had the pleasure of joining Dell in a green IT/ green workplace make-over of one of their small business customers. Roberson Homes is a family run business in St. Cloud, Florida that specializes in designing and building sustainable homes in the area. Meeting the family was great – they are clearly passionate about their business and about the environment. A company after my own heart! If you’re looking for a great green homebuilder in the Orlando area, give these guys a call! And, the new PowerEdge T300 server is 23 percent more efficient than their previous server. Given that technology usage accounts for roughly 30 percent of a small business energy bill, Robertson Homes will see significant cost savings while reducing its carbon footprint. Not only is the Optiplex 960 eco-friendly it requires less maintenance – many small companies just don’t have time for routine IT maintenance. It takes them away from their core business and making money for the company. According to Gartner, companies can spend up to 2x-3x times more on desktop maintenance than the initial purchase cost – approximately $5,800 per desktop and $9,900 per laptop annually. The savings over time can be tremendous. While Dell was working their magic for Robertson Homes’ green IT, I got a chance to look around the office. 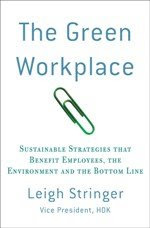 Turns out they were doing lots of great things to save energy and make their office greener. Tune in tomorrow to see what new green strategies we implemented at Robertson Homes that you can implement too.